Soaking in warm water for 5-10 minutes before use. To be cooked or fried before use. Caught in Indian Ocean / Pacific Ocean; FOA zone no. 51/71, Trawls. Ingredients: Shrimp (Crustaceans) (95%), Salt (5%). 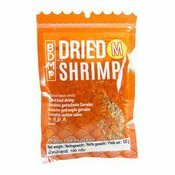 Simply enter your details below and we will send you an e-mail when “Salted Dried Shrimps (M) (蝦米(M))” is back in stock!